An unusual feature of New York’s health care system is its lack of for-profit hospitals, which are common in the rest of the country. Their absence is the result of unique state laws, which effectively ban hospital ownership by publicly traded corporations and discourage for-profit ownership generally. This policy not only sets New York’s hospital industry apart from those in most other states, but also from the rest of the state’s health care system, where for-profit ownership is prevalent. Much has changed about hospitals, and health care generally, since these laws took their current form in the mid-1960s—raising the question of whether they are well-suited to 21st century conditions. In recent years, Governor Andrew Cuomo and others have proposed authorizing for-profit ownership of a limited number of hospitals as a way of spurring private investment in financially troubled facilities. One such demonstration project passed the state Senate in 2015 but was not taken up by the Assembly. Opponents of the proposals raised concerns that for-profit hospitals would tend to provide lower-quality care, charge higher prices and avoid serving lower-income and uninsured populations. Beyond the limited debate on those measures, the effectiveness of the state’s hospital ownership laws has gone largely unexamined. Analyzes nationwide financial and quality data to compare the condition and performance of New York’s hospital industry to those of other states. Surveys the research literature on differences between for-profit and not-for-profit hospitals. Estimates the lost revenue associated with the tax exemptions of not-for-profit hospitals. Explores the value of “community benefits” reported by 20 of the state’s largest not-for-profit hospitals. Inventories the state’s increasing expenditures on capital grants for hospitals and other health care facilities. Reviews the effect on New York’s dialysis clinics when corporate, for-profit ownership was authorized in 2007. On the question of comparative quality between for-profit and not-for-profit hospitals, the evidence is mixed—with some research showing that for-profits tend to be of lower quality than not-for-profits, on average, and other research showing little or no difference. Meta-studies indicate that the former outnumber the latter. Behind those averages are variations in performance among all ownership types, with some for-profit hospitals meeting high standards, and some not-for-profits falling short. A policy that discriminates on the basis of for-profit ownership will thus exclude high-quality for-profit hospitals while failing to exclude low-quality not-for-profits. On accessibility to the poor, federal financial data show little if any difference between for-profits and not-for-profits. Both ownership categories treat Medicaid patients and provide free care for the poor at roughly the same rate—a pattern that could be expected to apply in New York as well. Financially, authorizing for-profit ownership would have certain inherent advantages. By definition, for-profit hospitals are not tax-exempt and therefore generate revenue for government—revenue that could be particularly significant at the local level. For-profits also tend to have higher operating margins and readier access to capital funds, meaning they are less likely to need government assistance to modernize facilities and maintain fiscal health. With the industry nationwide in a period of consolidation, many New York hospitals are contemplating changes in ownership, such as joining networks or being acquired by larger institutions. Others are struggling with operating losses and heavy debt loads that put them in jeopardy of closure. Authorizing for-profit ownership would potentially give hospital leaders facing these situations a broader menu of options. It would open the door to previously untapped sources of capital and—if and when an institution chooses to become for-profit—provide additional tax revenues for state and local government. A 2014 study in the Journal of the American Medical Association found that hospitals converting to for-profit ownership generally improved their financial strength without significantly affecting their quality of care or the share of low-income and minority-group patients they treated. Changing ownership laws, by itself, would not be enough to fully address the issues of quality, financial condition and access facing New York’s hospitals—which deserve further exploration. However, the evidence suggests that the potential benefits of allowing for-profit investment in hospitals would outweigh the potential risks. Despite a concentration of world-famous institutions in Manhattan, New York’s hospitals collectively rank at the bottom of the federal government’s quality ratings and score substantially lower than the national average on other major report cards. The amount of free care provided by New York’s not-for-profits in 2015—1.9 percent of operating revenues—was a third lower than the national averages for both not-for-profits and for-profits. 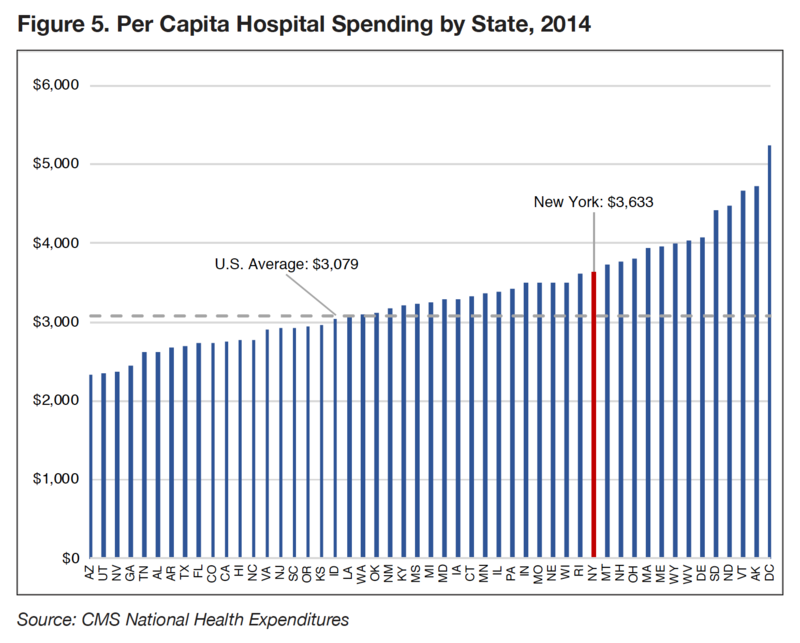 As of 2014, New York’s per capita spending on hospital care was 19 percent higher than the U.S. average. Tax exemptions for New York’s not-for-profit hospitals likely cost federal, state and local governments about $2 billion a year. In spite of high spending on hospital care and their tax-exempt status, New York’s hospitals collectively had the sixth-lowest profit margins, and the highest ratio of liabilities to assets, among the 50 states as of 2015. These factors compromise the hospitals’ ability to raise capital. Hospitals are increasingly relying on government funds to finance capital projects. In just the past five years, the state has allocated $3.8 billion in capital grants to hospitals and other health care providers. While for-profit hospitals score lower, on average, than not-for-profit hospitals nationwide, they score higher, on average, than New York hospitals of all types. The primary difference between not-for-profit and for-profit hospitals lies in their respective governing structures. For-profit hospitals are controlled by boards of shareholders with a fiduciary obligation to seek return on investment, while not-for-profits are overseen by boards of community volunteers with a duty to fulfill an institutional mission, i.e., providing medical care. Another important difference is tax status: Not-for-profit hospitals are exempt from most federal, state and local taxes; for-profit hospitals are not. In return for their tax exemptions, not-for-profit hospitals are obliged to provide certain charitable benefits—although the standards for fulfilling that requirement are vague. A third distinction concerns access to capital: Not-for-profit hospitals are eligible to borrow money through tax exempt bonds, which carry lower interest rates than taxable bonds. For-profit hospitals, on the other hand, have the ability to raise capital funds by issuing stock, which can be a significant advantage. Beyond these internal distinctions, both ownership types engage in effectively the same business: delivering medical care in return for payment. Both are subject to the same public health laws and regulations, negotiate fees with the same insurance plans, hire from the same pools of professionals and, to a large degree, serve the same types of patients. Both need to operate in the black to survive over the long term, and therefore take steps to maximize revenue while controlling costs. The smallest category is government-owned hospitals, which are controlled, directly or indirectly, by elected officials and are legally accountable to the public. Often, they have a mandate to provide free or discounted care to the poor. They are exempt from taxation and, in many cases, receive direct subsidies from public funds to offset operating losses. These patterns are not uniform: On quality report cards, there are high-scoring for-profit hospitals and low-scoring not-for-profits. Some for-profit hospitals provide a substantial amount of free care to the indigent, while some not-for-profits provide little or none. To further blur the lines, many not-for-profit hospitals own for-profit subsidiaries, such as parking garages or medical office buildings, or contract with for-profit companies to provide management services. Regardless of their not-for-profit status, New York hospitals are some of the biggest businesses in the state, employing hundreds of thousands of people and generating billions of dollars in revenue. The highest-paid not-for-profit hospital CEOs in New York received more than $4 million in salary,2 comparable to what some Fortune 500 executives make. The first provision, Section 2801-a(3), says that anyone seeking to own a hospital, even in part, must undergo a review of “character, competence, and standing in the community” by the state’s Public Health and Health Planning Council, a branch of the Health Department. This review must include a check of the would-be owner’s previous record as a health care provider. The second provision, Section 2801-a(4), provides that all owners of a for-profit hospital must be “natural persons”—that is, no shares can be owned by corporations, such as investment banks or pension funds. The third, also in subsection a(4), says any sale or transfer involving 10 percent or more of a hospital’s value must be approved in advance by the state. For smaller transactions, the state must be given 90 days’ advance notice. Taken together, these three rules—mandatory background checks, no corporate ownership of shares and advance notice or approval of stock sales—make it impossible for publicly traded corporations to own hospitals in the state. Such companies have potentially thousands of stock holders who may or may not be natural persons, and their shares are bought or sold at a moment’s notice, a system incompatible with background checks or state approval of ownership transfers. The law theoretically leaves the door open to hospital ownership by some privately held companies—those with relatively few owners, each of which is a natural person who is willing to undergo a background check and accept limits on his or her future ability to sell shares. This model is common among the state’s nursing homes. However, for-profit ownership on those terms appears to have proven unviable in New York’s hospital industry. The amount of capital necessary to buy and own a hospital is much larger than it would be for a nursing home. This makes it a riskier and less attractive investment for small groups of individuals, especially when they need the state’s approval before liquidating their investment at in the future. Nationwide, for-profit hospitals are commonplace, representing 28 percent of institutions. The rest are not-for-profit (53 percent) or government-owned (20 percent). 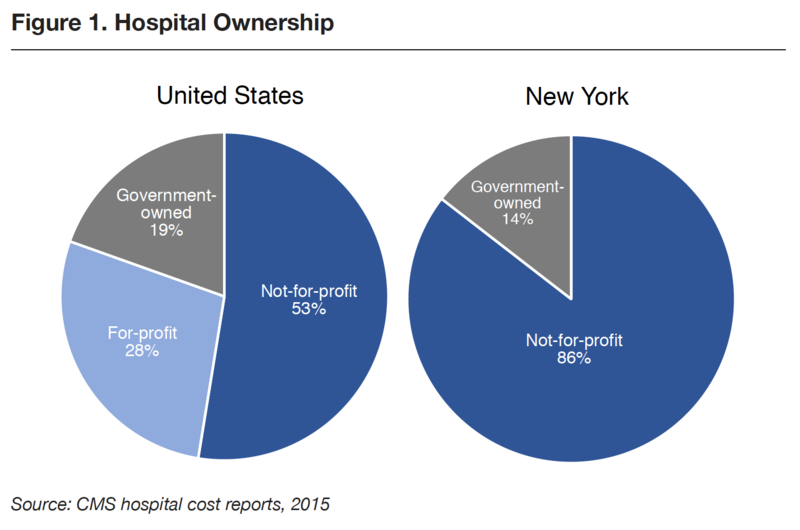 In New York, 86 percent of hospitals are not-for-profit, and the remainder are government-owned.6 (See Figure 1). Among other health care providers in New York State, as in the rest of the country, for-profit ownership is common, and in some cases dominant. Sixty percent of the state’s nursing homes are owned by for-profit companies,11 along with two-thirds of its dialysis centers.12 Many if not most private-practice physicians work in for-profit partnerships, which are increasingly consolidating into multi-specialty groups that compete with hospitals for outpatient surgery and other procedures. For-profit and corporate ownership is also common if not dominant in the broader health care industry, including drug makers, medical equipment suppliers, pharmacies, clinical laboratories and insurers. 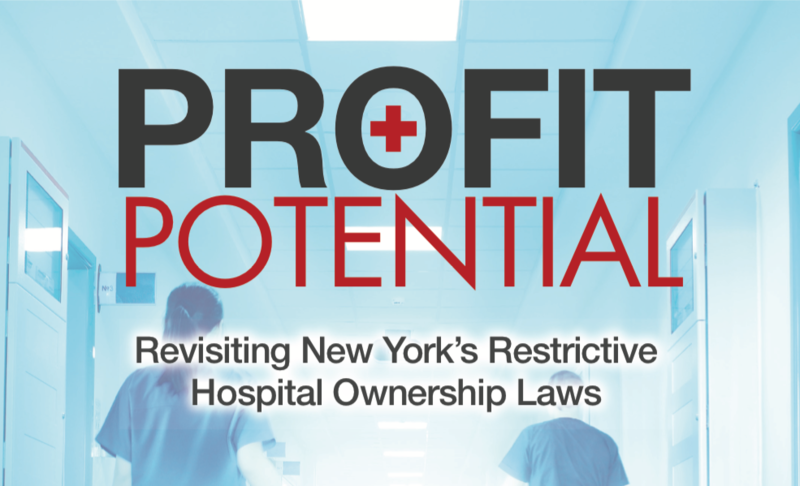 New York’s restrictions on for-profit hospital ownership are thus an exception to the norm, both nationally and within the state. To justify continuing such a policy, lawmakers should verify that it serves to measurably improve health care—or that changing the policy would foreseeably worsen health care. Previous comparative studies of hospital ownership have measured variation at the institutional level, looking at the relative performance of for-profit, not-for-profit and government-owned facilities on benchmarks of quality, cost, access and other indicators. An overview of that research is summarized below. However, this analysis is primarily focused on the costs and benefits of a statewide policy, not institutional practices. Thus, it also looks at performance benchmarks by state, comparing the numbers for New York (with its unique restrictions) against data from the rest of the country. Have restrictions on for-profit hospital ownership resulted in higher quality care? 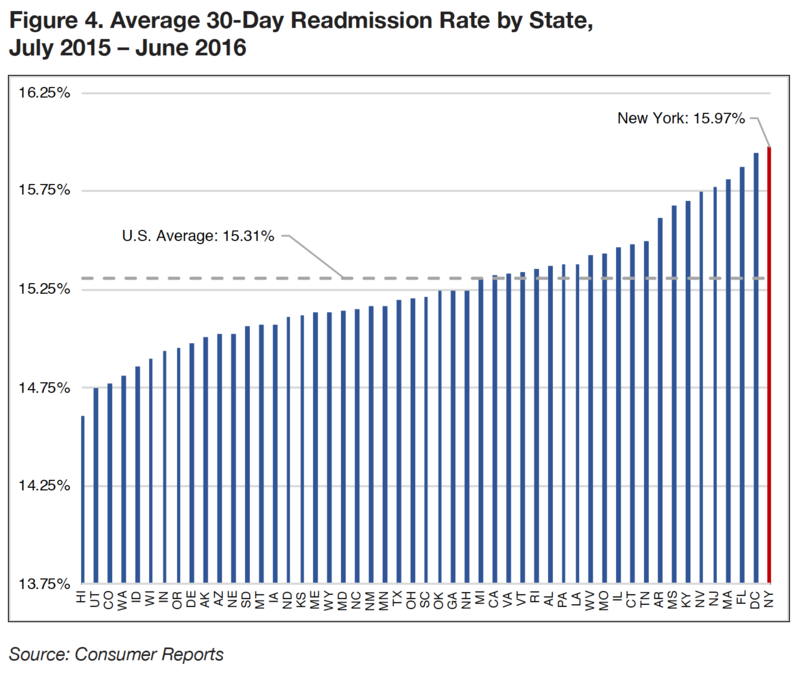 On major hospital report cards, New York’s average scores rank at or near the bottom. 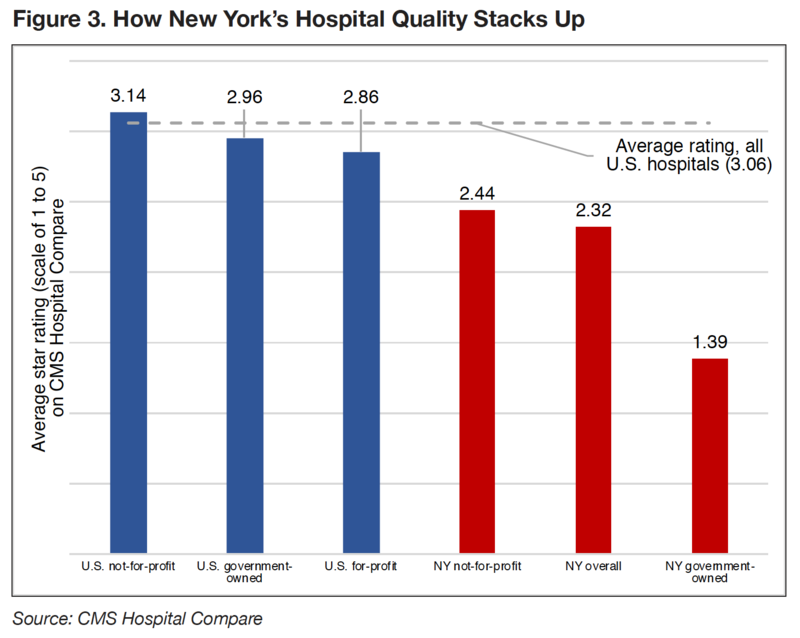 If a policy of discouraging for-profit hospitals were effective in promoting better care, it would be expected that quality indicators for New York’s hospitals would compare favorably to those of other states, where for-profit hospitals are common. A review of hospital report cards shows the opposite: New York’s hospitals, as a group, rank at or near the bottom. To be sure, New York is home to some of the best-regarded hospitals in the world. Of the 20 institutions on U.S. News & World Report’s 2017-18 Best Hospitals Honor Roll, three are located in New York City—New York-Presbyterian, Mount Sinai and NYU Langone—more than any other single city in the country.17 Memorial Sloan Kettering in Manhattan is the magazine’s second-best-ranked cancer center. Taken as a whole, however, New York’s hospitals receive poorer average report card grades than those of most other states. Other report cards paint a similarly unflattering picture of New York’s hospital system. Another common benchmark of overall hospital quality is the share of discharged patients who are readmitted within 30 days—which can be a sign of unsuccessful treatment or poor discharge planning. On this measure, based on federal data gathered by Consumer Reports, New York ranks last among the states. Hospital officials warn that rating systems can oversimplify the complexities of health care in ways that are misleading and unfair.24 Perhaps the most salient objection is that the major report cards do not adjust for socioeconomic status. Successfully treating patients who are poor or homeless, for example, can be especially challenging, and hospitals serving low-income neighborhoods generally receive lower quality scores. The evidence suggests that discouraging for-profit ownership, in and of itself, has not been effective in assuring high-quality hospital care. Has the current policy resulted in lower hospital costs? New York has higher-than-average hospital spending and employment levels. 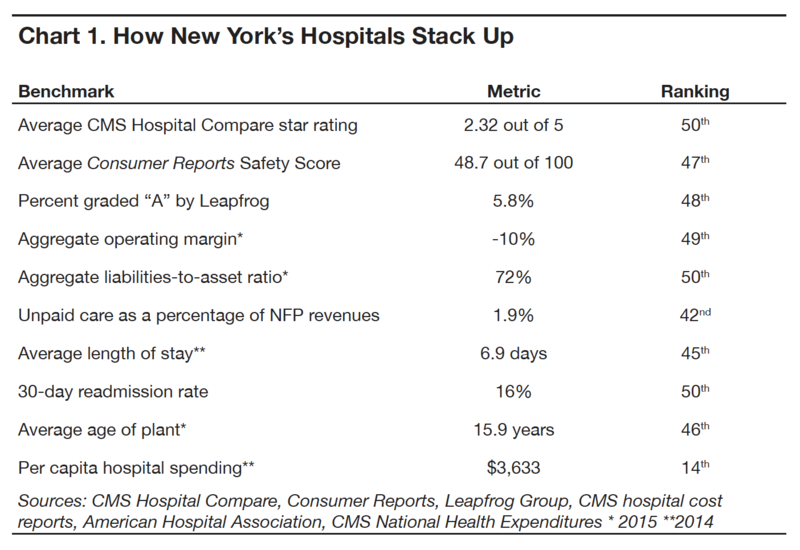 Along with low quality ratings, New York’s hospital system is characterized by high costs. There is little evidence to support the notion that restrictions on ownership have controlled costs. Has the current policy resulted in broader access to hospital care for the poor? When adjusted for New York’s higher Medicaid enrollment, the state’s not-for-profit hospitals are no more accessible to the poor than non-government-owned hospitals in other states. New York’s not-for-profit hospitals collectively treat more Medicaid patients than their national counterparts. However, this appears to be almost entirely due to the unusual size of New York’s Medicaid program. New York’s version of Medicaid—the government-sponsored health plan for the poor and disabled—is more than half-again larger than the national average. It covers 33 percent of the state’s population compared to 21 percent for the country as a whole. In financial terms, Medicaid accounted for 22 percent of hospitals’ 2015 patient revenue in New York, compared to 13 percent nationwide. Government-owned hospitals generally devote a larger share of their resources to treating Medicaid patients than private hospitals, whether for-profit or not-for-profit. In New York, that disparity is larger than for the country as a whole. In New York, Medicaid accounted for 42 percent of revenue for government-owned hospitals and 17 percent for not-for-profits. Thus, New York’s government-owned hospitals treated Medicaid patients at almost double the statewide rate (197 percent) while its not-for-profit hospitals treated them at 80 percent of the statewide rate. Proportionately, the disparity in care provided to Medicaid recipients between government-owned and private hospitals is greater in New York than in the nation as a whole. This suggests that excluding for-profit hospitals has not led to greater equality of access for the poor. Has the current policy resulted in greater availability of free care? New York’s not-for-profit hospitals provide less uncompensated care than the national average, and less than for-profits in other states. Hospitals of all kinds are legally required to provide certain kinds of critical medical care regardless of a patients’ ability to pay. However, the amount of free care provided varies widely from institution to institution, based in part on local poverty and uninsured rates, but also based on ownership type. Nationally, government-owned hospitals devote the largest share of their resources to free care, with private hospitals, both not-for-profit and for-profit, providing considerably less. 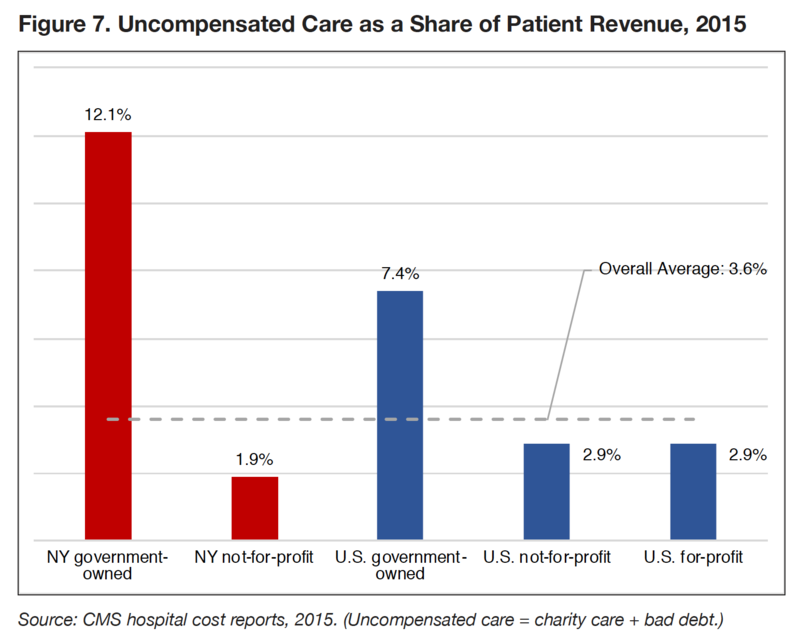 In New York, government-owned hospitals provide a larger share of uncompensated care than their counterparts in other states. Meanwhile, New York’s private hospitals—which are all not-for-profit—provide less uncompensated care than their peers nationwide. By one measure of free care, New York’s not-for-profits are roughly on par with for-profit hospitals in other states. But by another measure, New York’s not-for-profits provide substantially less free care than for-profit hospitals in other states. The first measure focuses on charity care—free services provided to patients who lack insurance and cannot afford to pay their full fees. The charity care provided by New York not-for-profit hospitals equates to just over 1 percent of patient revenue, compared to national averages of 1.5 percent for not-for-profits nationwide and just under 1 percent for for-profits. The second measure is uncompensated care, which includes both charity care and so-called bad debt—which is the uncollected fees from patients who have insurance, but who fail to pay their full copayments and deductibles. Nationally, government-owned hospitals provide uncompensated care about two and one-half times the rate of private hospitals, both for-profit and not-for-profit. In New York, the gap in uncompensated care between government-owned hospitals and not-for-profit hospitals is a factor of more than six. This evidence suggests that New York’s policy of discouraging for-profit hospitals is failing to foster charity care by not-for-profit hospitals and failing to avert segregation along economic and ethnic lines. Do New York’s hospitals face unusual demographic challenges that would explain their low quality scores? The state’s population is not dramatically out of line with national norms on key measures and is healthier than average in some respects. New York’s demographic profile includes concentrations of certain diseases, such as asthma and HIV, and a high poverty rate when adjusted for the cost of living. These and other factors could help to explain low quality scores and high costs for the hospitals treating those populations. At the same time, the state offers unusually generous health coverage for low-income residents, and its population is healthier than average in some respects. However, the state’s Medicaid program covers about 33 percent of the population, which, as of 2015, was also third highest in the country. While the state’s adjusted poverty rate was about three percentage points higher than the national average, its Medicaid penetration rate was more than 10 points higher. 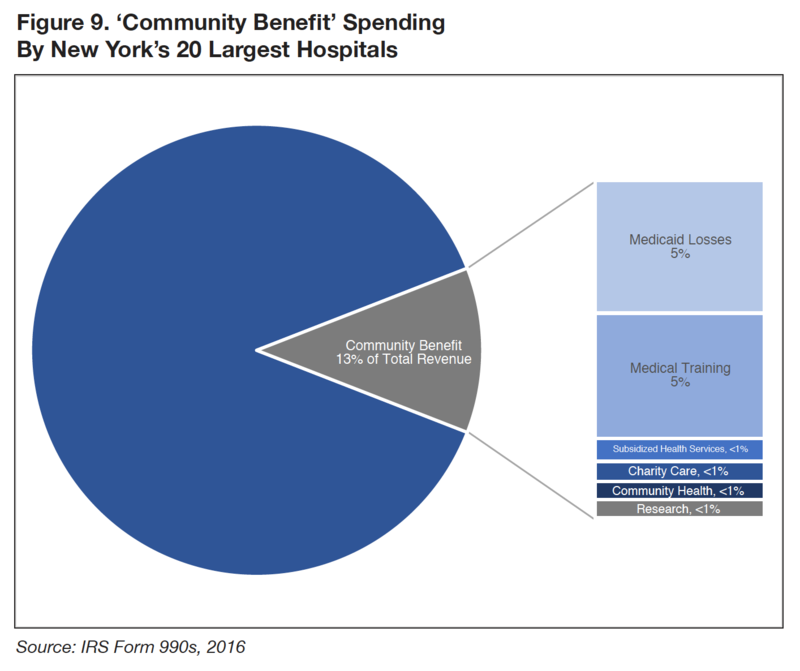 Medicaid pays hospitals less than other insurers, but the broader coverage New York provides to lower-income residents at least partly offsets the additional hospital expenses associated with treating the poor. New York’s adult obesity rate for 201636 and diabetes incidence rate for 201537 were both below average. Although this is not a comprehensive list of potential factors, demographics in and of themselves do not readily explain why New York’s hospital scores would rank so far below average. How does the quality of for-profit hospitals compare to not-for-profits? There is evidence that for-profit hospitals provide lower-quality care, on average, than not-for-profit hospitals—a gap that may have gotten smaller in recent years. Some of the more recent research has found relatively little difference in quality between for-profits and not-for-profits, possibly suggesting that changing regulatory and market pressures have reduced the performance gap. Behind the average for each ownership type is a broad range of scores, indicating that ownership type, by itself, is not always predictive of quality. Outstripping the difference between for-profit and not-for-profit hospitals nationally is the performance gap between hospitals in New York versus the country as a whole. 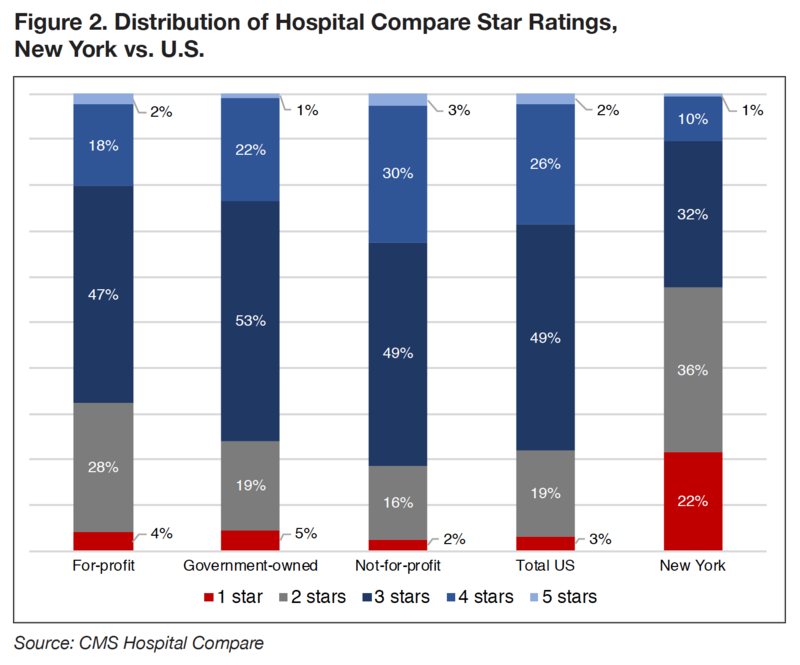 Nineteen percent of for-profit hospitals received four stars or better, compared to 9 percent among all hospitals in New York, where for-profits are absent. New York’s unusual situation is illustrated in Figure 8, a scatter plot juxtaposing the percentage of for-profit hospitals in each state against that state’s average score. 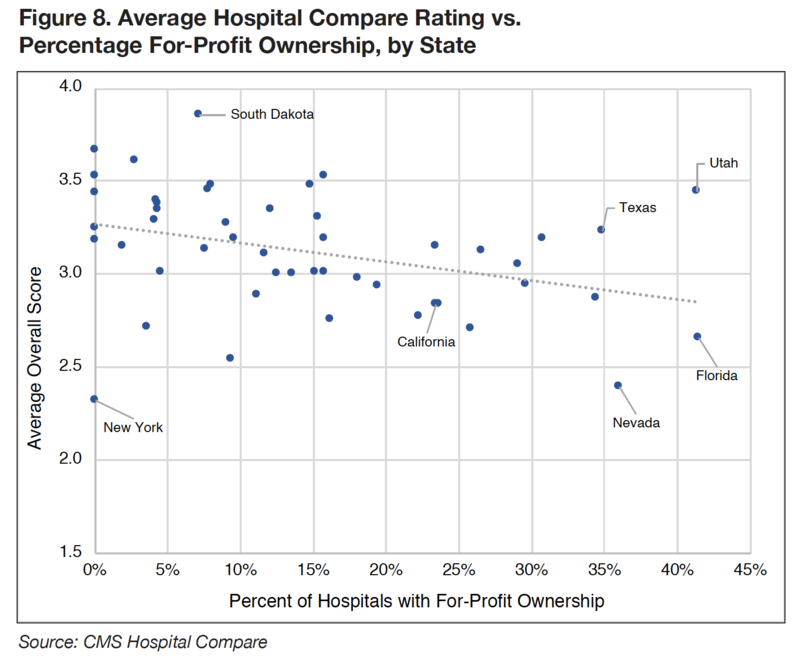 The chart shows that the two metrics are negatively correlated—i.e., states with a higher percentage of for-profit hospitals tend to have a lower average quality score. Among the outliers to this pattern is New York, which sits at the low end of both axes—and thus adds to the evidence that ownership type, by itself, is not enough to predict quality. What is the cost of tax exemptions granted to not-for-profit hospitals? Do those hospitals provide community benefits commensurate with the value of their tax exemptions? The tax exemptions of New York’s not-for-profit hospitals cost approximately $2 billion a year. The level of community benefits provided by not-for-profit hospitals varies widely, with no minimum standards imposed. The tax exemptions of not-for-profit hospitals—which are some of the biggest employers in the state—represent a loss of government revenue that otherwise would be collected. Not-for-profit hospitals are exempt from paying both federal and state corporate taxes, along with state and local sales taxes and property taxes. The bonds issued on their behalf to finance capital projects are also often tax-exempt, and the donations they receive are tax-deductible. The value of the exemptions in New York, with its relatively high taxes, was estimated at $10 million per hospital, which ranked among the top 10 among the 50 states.54 That translates to almost $2 billion in lost revenue—half for the federal government, and half for state and local governments. In their federal cost reports for 2015, New York’s not-for-profit hospitals reported owning $29.5 billion in land and buildings that would otherwise be subject to property taxes. Tax rates vary widely from place to place, but the state Department of Taxation and Finance calculated the average full-value rate for 2015 at $28 per $1,000.55 Using that figure as a rough benchmark, hospitals collectively saved about $826 million in unpaid municipal, county and school property taxes. The approximate school tax they avoid, at about $22 million, is the equivalent of 19 percent of the city’s school district’s tax levy—meaning that if the hospitals were fully taxable, the burden on other Albany property owners would be 19 percent less.58 For a home assessed at $200,000, that would translate to an annual tax savings of more than $800. In return for tax protection, hospitals and other charitable enterprises are expected to generate a corresponding benefit to the community. In the past, not-for-profit hospitals could satisfy that expectation simply by providing health care, which was seen as inherently beneficial to society. In more recent years, as health care delivery has become more businesslike and lucrative, hospitals have come under increasing pressure to document their charitable activities—and there have been calls for establishing minimum community-benefit standards that hospitals would have to meet in order to retain not-for-profit status. Hospitals are obliged to document their community benefit activities in a special section of their annual filings with the IRS, known as Form 990s. More than one-third of that amount, or about 5 percent of revenues, was the reported cost of “graduate medical education”—i.e., training for young physicians who have finished medical school but not yet been licensed. Some critics question whether this expense should count as community benefit, since GME is otherwise subsidized by Medicare, physicians in training are a source of low-cost labor for teaching hospitals and many doctors leave the state after completing their training. The next largest share of the 20 hospitals’ community benefits (or 5 percent of their revenues) were losses incurred treating patients on Medicaid and other means-tested government programs, which typically pay less than private insurance. For-profit hospitals sustain similar losses when they treat patients in these programs. Even after accounting for the cost of community benefits, the 20 hospitals’ revenue exceeded expenses by $1.1 billion, or 3.4 percent. For-profit hospitals do not file Form 990s and are not required to disclose community benefits. 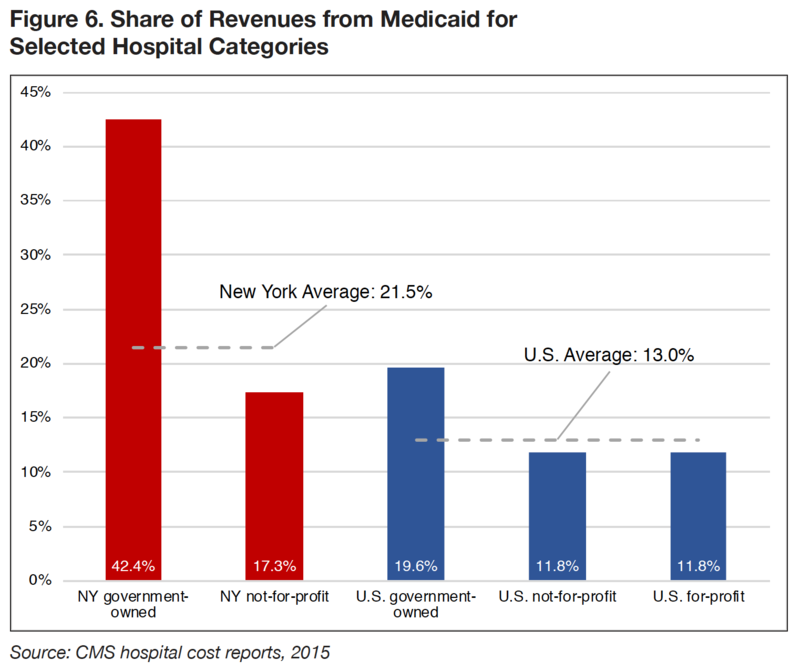 As discussed above, however, for-profit hospitals on average provide as much or more Medicaid and charity care as New York’s not-for-profits do, even as they pay full taxes. How would allowing for-profit ownership affect capital investment in hospitals? Changing ownership laws would open the door to an infusion of private investment in New York’s hospitals, potentially mitigating a growing expense for the state. Like other businesses, hospitals need regular infusions of capital funds to expand or modernize facilities and purchase major equipment. Hospitals of all ownership types raise capital by setting aside a portion of annual profits and by borrowing money through loans and bond issues. Not-for-profit hospitals can also solicit charitable donations toward capital projects. In New York, state government has made available billions in capital grants for hospitals and other health care institutions (discussed further below). Unlike not-for-profit and government-owned facilities, for-profit hospitals have the additional option of raising capital from private investors, either by selling ownership stakes in a private company or issuing shares of stock to the public. As a result, for-profit hospitals as a group carry far less debt. In financial statements for 2015, for-profit hospitals reported aggregate liabilities equal to 11 percent of their assets, compared to 45 percent for not-for-profit hospitals. For-profit hospitals also realized higher profits in 2015—averaging 11 percent, compared to 5 percent for not-for-profits nationwide—which further enabled higher levels of capital investment. Some of New York’s hospitals maintain consistently positive operating margins and have relatively little trouble raising capital through borrowing and contributions. Others frequently lose money and already carry heavy debt loads. Often these are the hospitals most in need of investment to improve their facilities. As a group, New York’s hospitals face more capital challenges than their not-for-profit counterparts in other states. The overall liabilities-to-asset ratio for New York hospitals in 2015 was 72 percent, the highest of any state. Among not-for-profits alone, it was 66 percent, compared to a national average of 45 percent. New York’s not-for-profits also realized aggregate margins of just 1.8 percent in 2015, barely one-third the national average for not-for-profits of 5.2 percent— leaving them relatively little money to allocate for capital. Given these conditions, New York’s hospitals have increasingly looked to state government for capital support. 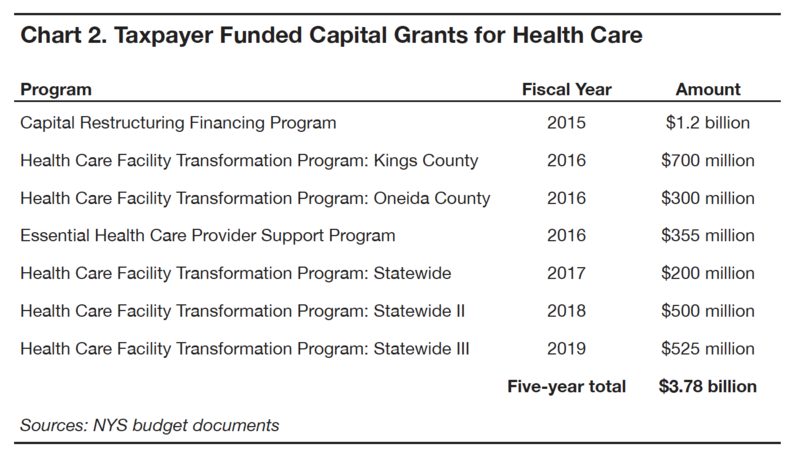 In March 2016, for example, the Healthcare Association of New York State (HANYS), a trade group for hospitals and nursing homes, included the “urgent need for capital funding” on its list of budget requests from the state Legislature. The state has traditionally supported the capital needs of hospitals by providing low-interest, tax-exempt loans through bonds issued by the Dormitory Authority. More recently, the state has also provided outright grants. Not all of the state’s capital grants have gone to hospitals, and not all of them have been distributed according to need. In March 2016, for example, the Cuomo administration announced the awards of $1.6 billion in health care grants to 162 recipients.66 Of that amount, about a quarter, or $386 million, went to hospitals on the Health Department’s “watch list” of fiscally distressed institutions. Eleven of 32 hospitals on the watch list received no funding in that round of grants. Other grants included a total of $25 million to Crystal Run Healthcare, a rapidly growing for-profit multi-specialty physician group in Orange County, which used the money to finance a pair of medical office buildings. A $7.9 million grant went to New York-Presbyterian Hospital in Manhattan, the state’s largest hospital, which reported a $270 million surplus of revenues over expenses for 2015. In response to the distressed financial condition of many New York hospitals, Albany lawmakers have recently contemplated rolling back the state’s restrictions on private investment, albeit in limited fashion. A bill sponsored by Senate Health Chairman Kemp Hannon (R-Nassau County) from 2013 through 2016 called for a pilot project that would authorize business corporations to acquire as many as 10 hospitals.68 These corporations could not be publicly traded, but their owners would be exempt from other requirements, including the “natural person” rule, character and competence reviews and prior approval of sales and transfers. Such acquisitions would be subject to approval by the Public Health and Health Planning Council. Would-be hospital buyers would have to commit to maintaining existing service levels and quality of care, retaining staff and creating a foundation to benefit the public health, among other conditions. A similar pilot project was included in Governor Cuomo’s executive budget proposals for fiscal years 2014 through 2016.69 The governor’s proposals were more restrictive than the Senate’s. The 2014 version authorized no more than two for-profit hospitals (one of which had to be located in Brooklyn), and the later versions authorized no more than five. However, the governor omitted some of the other conditions in Hannon’s bill. Cuomo’s proposals never made it into law. Hannon’s bill passed the Senate in 2015, but was never taken up by the Assembly. The most recent major change to state’s health care ownership policies came in 2007, when lawmakers waived some requirement of Article 28 for dialysis clinics.70 That change holds potential lessons for policymaking on hospital ownership. At the time, the dialysis industry in New York, as limited by Article 28, consisted mostly of small, independent operators that struggled to afford up-to-date technology—causing both their finances and patient services to suffer. The industry in the rest of the country was increasingly dominated by for-profit chains which, due to economies of scale, had more money to invest in modern equipment that improved quality and saved money. The Legislature’s response was a bill that rolled back key parts of Article 28, allowing national chains, including publicly traded corporations, to directly operate in the state. The legislation modified or waived the rules requiring owners to be “natural persons,” to undergo background checks and to seek state approval of stock sales. “Many New York dialysis care providers have operated on very thin profit margins and have limited access to capital,” said a memorandum accompanying the bill. “This, in turn, has hampered their ability to invest in new technology. The bill was cosponsored by the Legislature’s two longtime Health Committee chairmen, Assemblyman Richard Gottfried (D-Manhattan) and Senator Kemp Hannon (R-Nassau County). It passed with broad bipartisan support and was signed by then-Governor Eliot Spitzer. In the decade since, the ownership of the state’s dialysis clinics has shifted significantly. Two-thirds are now for-profit, up from 49 percent in 2007. Over that same period, the state’s performance on dialysis quality measures tracked by the federal government has improved. Another benchmark tracked by CMS is the share of patients with a urea removal rate of 65 percent or greater, a measure of how effectively their blood was filtered. In 2007, the state’s clinics were meeting that standard for an average of 94.7 percent of their patients. By 2014, the average rate was up to 98.2 percent. Despite signs of improvement, New York clinics continue to lag the national average. On Dialysis Facility Compare—a five-star rating system combining multiple quality measures, similar to Hospital Compare—the New York’s average rating of 3.2 stars is 45th highest among the states. 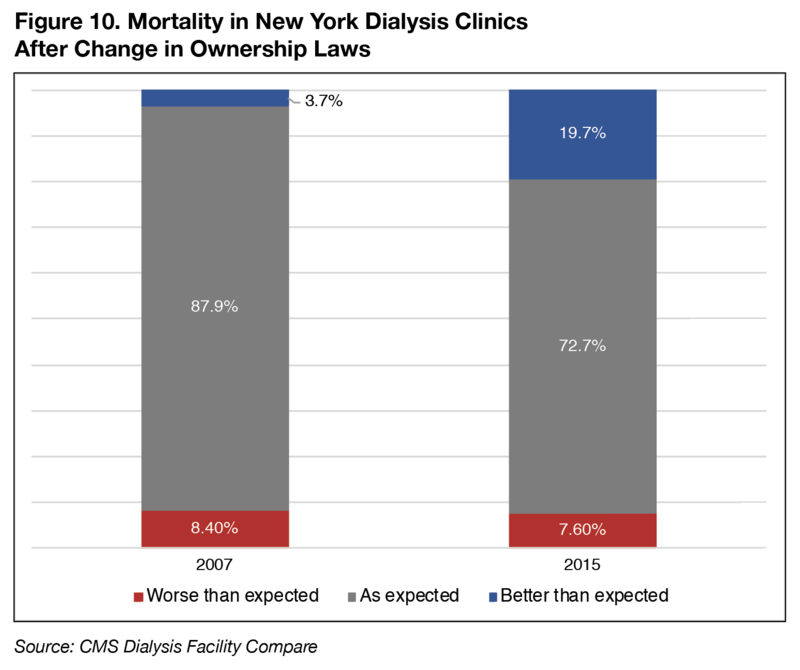 Both the signs of improvement among New York clinics and their continued below-average ratings could be explained by one factor: the growing but still limited role of chain-owned clinics in the state’s dialysis industry. As lawmakers noted in passing the 2007 law, the higher volume and greater resources of chain-owned clinics appear to result in greater efficiency and higher quality. On Dialysis Facility Compare, chain facilities score an average of 3.4 stars, while the average for independent clinics is 3.1. This is a bigger difference than the gap between the not-for-profits, which average 3.4, and for-profits, which average 3.3. For-profit chains, at 3.4, also outscore not-for-profit independents, at 3.3. These patterns are further evidence that ownership type can be less predictive of quality than other factors, such asmembership in a chain—which undermines the justification for a policy focused on ownership type. Clinics dedicated to the single service of providing dialysis are of course smaller in scale and less complex than hospitals, so caution is warranted in applying lessons from one industry to the other. However, the state’s experience with dialysis clinics over the past decade suggests that broadening for-profit ownership of health care facilities can be associated with improvements in quality of care. New York’s longstanding restrictions on for-profit hospital ownership are an unusual and consequential intervention in the state’s health care industry. These laws have not merely limited the presence of for-profit general hospitals in the state but eliminated them completely. Based on the evidence presented in this report, there is little indication that excluding for-profit hospitals has resulted in a public health advantage for New York. As discussed previously, the average quality ratings of the state’s hospitals rank at or near the bottom of national report cards; the state’s per capita spending on hospital care is higher than the norm, and its not-for-profit institutions provide lower-than-average levels of uncompensated care to the indigent, among other negative indicators. Longstanding ownership restrictions did not necessarily cause these shortcomings, but the restrictions do not appear to have ameliorated them, either. Also weighing against the status quo are financial factors, such as the loss of tax revenue that for-profit hospitals would otherwise pay and the loss of capital investment that for-profit hospital companies might otherwise make in New York’s health care system. It could be argued that lack of effectiveness alone is reason enough to reverse a restrictive policy that applies to no other major sector of New York’s economy. As a practical matter, however, any proposal to change the policy must address concerns that introducing for-profit hospitals into New York would have a further negative effect on quality, cost and access. Evidence presented in this paper indicates that some of these concerns are exaggerated or misplaced. Financial data, for example, show that for-profit hospitals, in the aggregate, provide roughly the same levels of Medicaid care and uncompensated care as not-for-profit hospitals. Meanwhile, data show that for-profit hospitals maintain larger profit margins, more cash reserves and lower debt levels than not-for-profit hospitals, meaning they are less dependent on government for subsidies, loans and capital infusions. On quality, the evidence is harder to parse. On one hand, the comparative research summarized above, coupled with scores for Hospital Compare and other report cards, indicate that for-profit hospitals tend to be of lower quality, on average, than not-for-profit and government-owned hospitals at the national level. That gap appears to be narrowing with the advent of improved quality measurement and value-based financial incentives, but has not disappeared. On the other hand, New York—where for-profit hospitals are effectively banned— has some of the lowest quality scores of any state. A possible explanation for New York’s quality gap is that hospital performance is being dragged down by underlying features of the state’s operating environment—such as demographics, economics or regulatory structure. Those features would presumably diminish the quality of for-profit hospitals as well. If so, a change in ownership laws by itself would have little impact. Another possible explanation is that the absence of for-profit owners has contributed to the performance gap by insulating the state’s hospital industry from competition and limiting its access to innovative managers and their successful practices. If so, the state would stand to gain from a change in ownership policy. In weighing this mix of evidence, it’s important to remember that a change in ownership laws would not authorize any particular for-profit company to operate in New York. Rather, it would give such a company the right to apply for an ownership license, in some cases in competition with other bidders. For-profit bidders would be subject to the multiple layers of review that any change in hospital ownership would necessarily undergo. This process could be used to screen out lower-quality options. The most likely avenue for a for-profit company to enter New York is not opening a new facility in a crowded market, but converting one that already exists. To start, such a conversion would need support from the institution’s board of directors. As volunteers with a demonstrated concern for both the hospital in question and its community, and with no prospect of financial gain, hospital directors could be expected to vet would-be buyers and reject those with poor track records. The next layer would be the state Health Department and its Public Health and Health Planning Council. Even if the restrictions on for-profit ownership were loosened, these regulators would retain authority to review the history of the acquiring company and its management—and check the background of major owners involved in operations. They could be specifically empowered to reject would-be buyers who have operated low-rated hospitals in other states. The reorganized company would also have a legal obligation to compensate the public for the loss of a charitable asset, which often means endowing a health-oriented foundation or simply making payments to the state. That process would need approval from both New York’s attorney general and a court, both of which would be duty-bound to reject deals that work to the disadvantage of the public. How much interest for-profit hospital companies and other investors would have in acquiring New York facilities is difficult to gauge. There was little public campaigning in favor of the reform proposals floated over the past several years, possibly because the state’s hospitals have been effectively closed to private investment for so long. Some industry officials anticipate that the big chains would be discouraged by New York’s environment of relatively tight regulations and slim financial margins. Others see the state’s market as too big and lucrative to go untapped forever. A change in New York’s hospital ownership laws would not mandate the conversion of any hospital to for-profit status. Rather, it would provide hospital managers with an additional option for managing the financial futures of their institutions. For-profit conversions would be voluntary, require both a willing seller and a willing buyer, and be subject to multiple layers of regulation. Current laws effectively veto all such deals in advance. A changed policy would allow each to be weighed on the merits. Conversion would hold relatively less appeal for big-name academic medical centers and other high-quality, financially strong institutions that have thrived as not-for-profits. The more likely candidates would be lower-quality, financially weaker institutions—of which there are many scattered across the state. For them, buy-outs might represent a lifeline, the chance for increased stability rather than continuing decline and bankruptcy. Small shareholders with no role in running a hospital, and their routine sales of stock, would no longer be subject to background checks—a procedure that is, at best, an indirect form of oversight. The Health Department would still have full licensing authority over the company and its management, as well as all of the doctors, nurses and other medical professionals on its staff. Through its “certificate of need” law, the state would continue to control which types of care—such as delivering babies or performing heart surgery—hospitals can add or subtract from their menu of services. This would limit the risk that a for-profit company would aggressively “poach” lucrative patients from not-for-profit rivals. Not-for-profit hospitals would also continue to enjoy the significant competitive advantage of exemption from taxes and access to government-backed low-interest bonds. For-profits, meanwhile, would pay full corporate income, sales and property taxes, becoming a potentially significant source of revenue, especially for local government. A 2014 study in the Journal of the American Medical Association, referenced earlier, offers perhaps the most pertinent lessons for New York’s situation. The study analyzed the outcome of 237 for-profit hospital conversions, comparing their financial status, quality performance and patient mix to a control group of 631 hospitals that remained not-for-profit or government-owned. The analysis used Medicare data from 1.8 million patients from 2002 to 2010—a more recent period than most other studies. The authors found that converting hospitals improved their operating margins by an average of 2.2 percentage points—shifting from modest losses to modest gains—compared to 0.4 points for non-converting hospitals. At the same time, they found that mortality rates and other quality metrics generally improved at all hospitals, with no statistically significant difference between those that converted to for-profit and those that retained their former status. The authors further found that converting hospitals as a group treated more patients who were African-American, Hispanic and recipients of Medicaid than the control group—and that there was no significant change in their collective patient mix after conversion. Ownership reform that produced similar results for New York—an improvement in the financial status of converting hospitals without any harm to quality or access—would be a positive for the state. The proposals from Governor Cuomo and Senator Hannon both took the form of demonstration projects that would open the door to for-profit ownership, but for a limited number hospitals and subject to special conditions. This cautious approach would be one way to assuage concern about the effect of changing a long-standing policy and make it easier for state regulators to manage and monitor the transition. Policymakers should also be aware of pitfalls. Capping the number of for-profit hospitals to be authorized, and imposing restrictions on stock ownership and sales, might have a chilling effect on potential investors. These provisions might discourage long-term investments by more risk-averse companies while opening the door to smaller, less experienced groups focused on short-term returns. Also potentially counterproductive are provisions that would forbid corporate owners from paring back unprofitable services or cutting staff at hospitals they acquire. In some circumstances, those steps could be necessary for a successful turnaround. To maximize the benefits of private investment, the state could set guidelines giving preference to conversion proposals aimed at hospitals with low quality or weak finances. The state could be especially welcoming to companies that would invest in hospitals on the Health Department’s fiscal “watch list” or those in underserved communities, including lower-income neighborhoods of New York City and rural areas of upstate. To assure that the public gets adequate value in return for tax exemptions, lawmakers should consider setting minimum standards for the “community benefits” that not-for-profit hospitals must provide and tightening the definition of what qualifies as benefit. Finally, lawmakers should take note of the significant shortcomings in hospital performance documented in this report, which ownership reform alone would be unlikely to resolve. Whether those shortcomings are the result of management practices, money issues, demographics or regulatory environment, they demand deeper examination and broader policy responses. 1 Hsueh-Fen Chen, et al., “Hospital Financial Conditions and the Provision of Unprofitable Services,” Atlantic Economic Journal 37, no. 3 (September 1, 2009), https://www.ncbi.nlm. nih.gov/pmc/articles/PMC3103087/. 2 IRS Form 990 data downloaded from guidestar.org. 3 The full text of Public Health Law Article 28 is available at https://law.justia.com/codes/new-york/2015/pbh/article-28/. 4 Barbara Benson, “After long fight, Queens’ Parkway Hospital closes,” Crain’s New York Business, November 5, 2008, http://www. crainsnewyork.com/article/20081105/ FREE/811059975/after-long-fight-queens-parkway-hospital-closes. 5 Federal data for 2015 show at least one for-profit hospital in each state except Hawaii, Maine and Vermont. The single for-profit hospital shown for Connecticut converted to not-for-profit ownership in 2017. A handful of for-profit psychiatric hospitals operate in New York. That specialized category was omitted from both the state and national analyses in this report. 6 Unless otherwise noted, hospital financial data are drawn from cost reports (Form 2552- 10) filed with the Centers for Medicare & Medicaid Services for 2015 and downloaded from www.cms.gov. 8 “HCA at a Glance,” HCAHealthcare.com, https://hcahealthcare.com/about/hca-at-a-glance.dot. 9 Karen E. Joynt et al., “Association Between Hospital Conversions to For-Profit Status and Clinical and Economic Outcomes,” Journal of the American Medical Association 312, no. 16 (2014), https://jamanetwork.com/journals/jama/fullarticle/1917437. 10 For-profit to not-for-profit conversions also occur, but they were not examined or counted in the Journal of the American Medical Association study. 11 CMS Nursing Home Compare data downloaded from https://data.medicare.gov/data/ nursing-home-compare. 12 CMS Dialysis Facility Compare data downloaded from https://data.medicare.gov/data/ dialysis-facility-compare. 14 Chris Bragg, “Cuomo donor got $25M for projects it was going to build anyway,” Albany Times Union, February 12, 2017, http://www. timesunion.com/tuplus-local/article/Cuomo-donor-got-25M-for-project-it-was-going-to-10917865.php. 15 New York State Department of Labor spreadsheet downloaded from https://labor. ny.gov/stats/nys/Largest-private-sector-employers-NYS.shtm. 16 Daniel Axelrod, “Crystal Run-Montefiore merger finalized,” Middletown Times Herald- Record, January 4, 2018, http://www.recordonline.com/news/20180104/crystal-run-montefiore-merger-finalized. 17 “U.S. News & World Report Announces the 2017-18 Best Hospitals,” U.S. News & World Report, August 8, 2017, www.usnews.com/ info/blogs/press-room/articles/2017-08-08/ us-news-announces-2017-18-best-hospitals. 18 For details about Hospital Compare, see the website of CMS www.medicare.gov/hospitalcompare/search.html. 19 Analysis of Hospital Compare datasets downloaded from data.medicare.gov/data/ hospital-compare as of early December 2017. 21 Analysis of Consumer Reports Safety Scores, based on data provided to the author by Consumer Reports. For details on how the scores are calculated, see https://www.consumerreports.org/cro/2012/10/how-we-rate-hospitals/index.htm. 22 Leapfrog Hospital Safety Grade state rankings for springs 2018, http://www.hospitalsafetygrade.org/your-hospitals-safety-grade/ state-rankings. 23 Op. cit., Consumer Reports. 24 For more on the limitations of hospital report cards, see “HANYS’ Report on Report Cards: Understanding Publicly Reported Hospital Quality Measures,” website of the Healthcare Association of New York State, October 2013, https://www.hanys.org/quality/data/ report_cards/2013/docs/2013_hanys_report_ card_book.pdf. 25 Table 12, “Health expenditures by state of residence: summary tables, 1991-2014,” National Health Expenditure Data, Centers for Medicare & Medicaid Services, https://www.cms.gov/Research-Statistics-Data-and-Systems/Statistics-Trends-and-Reports/ NationalHealthExpendDataindex.html. 28 American Hospital Association, “Trendwatch Chartbook 2016,” Table 3.2, https://www.aha. org/system/files/2018-01/2016-chartbook.pdf. 29 Author’s analysis of job and population figures from the Bureau of Labor Statistics and the Census Bureau. 30 Roosa Sofia Tikkanen et al., “Hospital Pay and Racial/Ethnic Mix at Private Academic Medical Centers in Boston and New York City,” International Journal of Health Services 47, no. 3 (February 2, 2017), http://journals.sagepub. com/doi/abs/10.1177/0020731416689549. 31 Trudi Renwick and Liana Fox, “The Supplemental Poverty Measure: 2015,” United States Census Bureau, September 2016, https://www. census.gov/content/dam/Census/library/publications/2016/demo/p60-258.pdf. 32 U.S. Census Bureau, “Percentage of People in Poverty by State Using 2- and 3-Year Averages: 2013-2014 and 2015-2016,” September 12, 2017, https://www.census.gov/library/publications/2017/demo/p60-259.html. 33 U.S. Census Bureau, “Health Insurance Coverage in the United States: 2016,” Table 6, https://www.census.gov/library/publications/2017/demo/p60-260.html. 35 Life expectancy downloaded from the Social Science Research Council’s “Measure of America,” http://www.measureofamerica.org/ maps/. 36 Laura M. Segal, et al., “The State of Obesity: Better Policies for a Healthier America,” The Trust for America’s Health and the Robert Wood Johnson Foundation, August 2017, https://stateofobesity.org/adult-obesity/. 37 Diabetes incidence data from the Centers for Disease Control and Prevention, https://www. cdc.gov/diabetes/data/index.html. 38 Centers for Disease Control and Prevention, https://www.cdc.gov/asthma/most_recent_ data_states.htm, https://www.cdc.gov/hiv/ statistics/overview/geographicdistribution. html. 39 Pew Research Center, “Estimated unauthorized immigrant population, by state, 2014,” http://www.pewhispanic.org/interactives/ unauthorized-immigrants/. 42 Megan McHugh et al., “An Early Look at Performance on the Emergency Care Measures Included in Medicare’s Hospital Inpatient Value-Based Purchasing Program,” Annals of Emergency Medicine 61, no. 6 (June 2013), https:// www.ncbi.nlm.nih.gov/pubmed/23489652. 46 Steffie Woolhandler and David U. Himmelstein, “Costs of Care and Administration at For-Profit and Other Hospitals in the United States,” New England Journal of Medicine 336, 769-74 (1997). 47 Mark McClellan and Douglas Staiger, “Comparing Hospital Quality at For-Profit and Not-for-Profit Hospitals,” in The Changing Hospital Industry: Comparing For-Profit and Not-for-Profit Institutions, ed. David M. Cutler (Chicago: University of Chicago Press, 2000), 93-112. 48 P.J. Devereaux et al., “A systematic review and meta-analysis of studies comparing mortality rates of private for-profit and private not-for-profit hospitals,” Canadian Medical Association Journal 166, no. 11 (May 28, 2002). 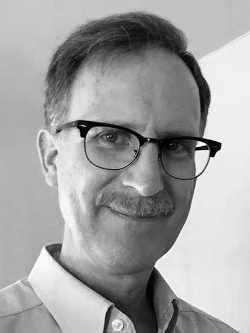 49 Pauline Vaillancourt Rosenau and Stephen H. Linder, “Two Decades of Research Comparing For-Profit and Nonprofit Health Provider Performance in the United States,” Social Science Quarterly 84, no. 2 (June 2003). 50 Peter Cram et al., “Uncompensated care provided by for-profit, not-for-profit, and government owned hospitals,” BMC Health Services Research 10, no. 90 (2010), www.biomedcentral. com/1472-6963/10/90. 51 Megan McHugh et al., “An Early Look at Performance on the Emergency Care Measures Included in Medicare’s Hospital Inpatient Value-Based Purchasing Program,” Annals of Emergency Medicine 61, no. 6 (June 2013). 53 Sara Rosenbaum et al., “The Value of the Nonprofit Hospital Tax Exemption Was $24.6 Billion in 2011,” Health Affairs 24, no. 7 (July 2015) https://www.healthaffairs. org/doi/abs/10.1377/hlthaff.2014.1424?url_ ver=Z39.88-2003&rfr_id=ori%3Arid%3Acrossref.org&rfr_dat=cr_pub%3Dpubmed. 55 “Statewide Full-Value Tax Rates, 2006-2015,” website of the New York State Department of Taxation and Finance, https://www.tax. ny.gov/research/property/reports/fvtaxrates/ statewide_13.htm. 57 Based on 2015 tax rates for the City of Albany found at the Empire Center’s SeeThroughNY Property Tax Calculator, http://www.seethroughny.net/benchmarking/property-tax-calculator/#. 58 Based on a school tax levy of $114 million, taken from www.albanyschools.org. 59 Amanda Fries, “Albany Med CEO calls on city’s large nonprofits to provide financial assistance,” Albany Times Union, October 19, 2016, http://www.timesunion.com/local/article/ Albany-Med-CEO-calls-on-city-s-large-nonprofits-9984330.php. 60 IRS Form 990 data for 2015 from New York-Presbyterian Hospital, Montefiore Medical Center, Mount Sinai Medical Center, Kaleida Health, North Shore University Hospital, NYU Hospitals Center, Long Island Jewish Medical Center, Beth Israel Medical Center, Staten Island University Hospital, New York Methodist Hospital, Albany Medical Center, Maimonides Medical Center, St. Luke’s-Roosevelt Hospital Center, Winthrop University Hospital, Bronx-Lebanon Hospital Center, Lenox Hill Hospital, Rochester General Hospital, New York-Presbyterian Queens Hospital, St. Peter’s Hospital and Good Samaritan Hospital. Downloaded from guidestar.org. 61 Age of plant was derived from figures in hospital cost reports by dividing the total accumulated depreciation of assets by the annual depreciation expense. 62 “Healthcare Leaders Urge Lawmakers To Protect Access to Care” (press release), Healthcare Association of New York State, March 2, 2016, https://www.hanys.org/communications/pr/2016/2016-03-02_healthcare_leaders_ urge_lawmakers_to_protect_access_to_care.cfm. 63 Public Authorities Law Section 1680-j. 64 New York State budget legislation for fiscal years 2015 through 2019. 65 Press release, “Governor Cuomo Announces Transformation of the Health Care System in Brooklyn,” January 24, 2018, https://www.governor.ny.gov/news/governor-cuomo-announces-transformation-health-care-system-brooklyn. 66 Press releases from the office of Governor Andrew M. Cuomo, March 4, 2016, found at www.governor.ny.gov/news. 67 “Debt Impact Study: An Analysis of New York State’s Debt Burden,” Office of the New York State Comptroller, December 2017, http:// www.osc.state.ny.us/reports/debt/debt-impact-study-2017.pdf. 68 S. 5092 of 2013-14, and S. 4790 of 2015-16. 69 Health and Mental Hygiene Article VII bills from the executive budgets for fiscal years 2014, 2015 and 2016, found at the publication archive of the New York Division of the Budget website, https://www.budget.ny.gov/pubs/archive/ index.html. 70 Chapter 315 of the Laws of 2007. 71 Legislative memorandum for S. 3987-A of 2017. 73 Quality and ownership data in this section come from the Dialysis Facility Compare program of the Centers for Medicare & Medicaid Services, found at https://data.medicare.gov/ data/dialysis-facility-compare. 74 Ken Schachter, “For-profit hospitals ‘inevitable’ for New York, LIJ chief says,” Newsday, May 21, 2015, https://www.newsday.com/ business/for-profit-hospitals-inevitable-for-new-york-lij-chief-says-1.10459781. 75 Bill Hammond, “Indigent Carelessness: How not to subsidize hospital charity care,” The Empire Center, September 18, 2017 https://www. empirecenter.org/publications/invincible-indigence/.